100 Days of Love (Movie Review): A lovely, cute romantic comedy with pleasing actors and few sweet moments. 100 Days of Love: Right from the first poster, the makers made it clear what to expect from the movie and makers succeeded in giving us what they promised. Jenuse Mohamed’s first film as director, is nothing more than a sweet and lovely romantic comedy. This is the story of Balan K Nair (Dulquer Salman) and two important characters in his life, his best friend – Ummar (Shekhar Menon) and his best love – Sheela (Nithya Menon). 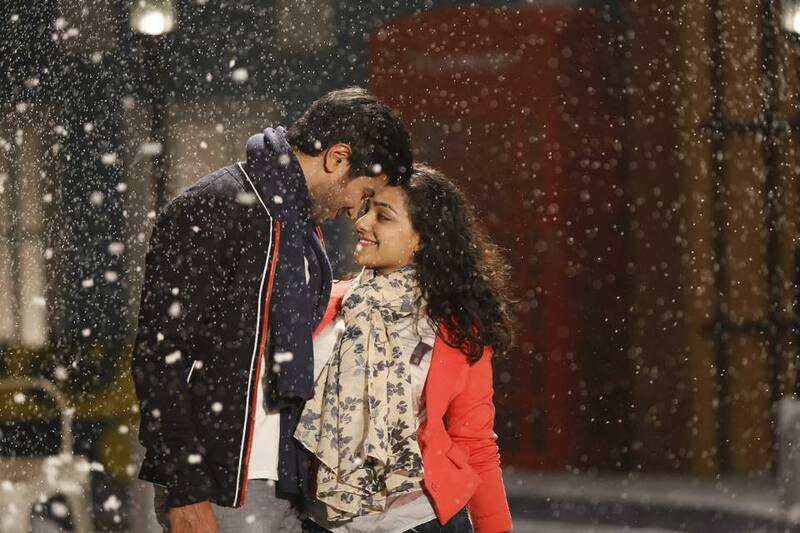 Like the charactor names, it is comedy and like the main actors, Dulquer and Nithya Menon, it is romantic. This movie scores highly in giving the freshness feeling of love, and it manages to keep it to the end and it stays there itself because we have all seen it all before and the movie depends too much on the main three lead actors to score. What surprised me about the movie was the humor presented throughout the movie, I found myself smiling and laughing at few scenes. Dulquer Salman. He is a gem. His screen presence, his voice, his body language and his expressions. Everything fits perfectly onscreen. Then Nithya Menon! She is who makes you fall in love with her on the first sight. She does that again. She make us feel to see her again after the first meeting at car – very much like Balan (Dulquer Salman) . Her performance is very good. Dulquer Salman and Nithya Menon, both delivered excellent performances in the lead roles here. There’s a real chemistry between Dulquer Salman and Nithya Menon and the relationship is believable. That’s the strength of the movie. Shekhar Menon as Ummar, Dulquer Salman’s dearest friend, is impressive as always. His combination scenes with Dulquer are very good. And it is good to see that makers gave importance to such a character. In another side, if you look at the character development you find that the script writer focused only on two characters, ie Ummar (Shekhar) and Balan K Nair (Dulquer). Govind Menon’s music is very good so is the setting, locations and costumes. The background music and the songs perfectly blend with the mood of the movie perfectly. Visuals are good enough for a Valentines Day Card. On the other side, could have avoided one or two scenes in the first half. You are going to love the cinematography, lighting and art work but at the same time you will also hate the out of order/awkward camera movement and placements in few shots. Eg. : First meeting of Dulquer Salman (Balan) and Aju (Romanch) at their office. The frame was 75% blank on the left side while the actor who is on the right end of the frame is looking to the right. It was too irritating when it repeated few times. Eg. : The steady cam shot of – first meeting of Dulquer Salman (Balan) and Aju (Romanch) near the elevator. Usually Malayalam industry keeps good distance from such 100% romantic movies unlike Tamil and Hindi. Malayalam industry never was good in such threads. There were many failed attempt to present something very romantic in recent past. Such attempts were too dramatic or boring like ‘Painkili’ but this one breaks the line. This ‘Painkili’ is good. If you want to watch a movie like Yeh Jawaani Hai Deewani or Kushi in Malayalam, then check this. If you want an enjoyable night at movies with your love, then this is a good choice. 100 Days Of Love is a lovely romantic-comedy with pleasing actors, beautiful songs and few good moments.